Perth's whale highway, the whales are coming! Specialist tour operator Gane and Marshall has teamed up with Isibindi Africa Lodges in South Africa to offer a discount on a twin-centre safari package to the Kruger National Park as part of a “Free Flights” special offer on departures in February 2015. The twin-centre Kruger Rhino Safari will take holidaymakers to the Kruger National Park, the largest game reserve in South Africa. The famous park is home to the “big five” and offers a wildlife experience that ranks with the best in Africa. Guests will spend the first two nights at the luxury Rhino Post Safari Lodge, an elegant 16-bed lodge from where they will enjoy twice daily game drives. Situated at the southern end of a 12,000 hectare private wilderness concession in the Kruger National Park, guests of Rhino Post Safari Lodge have exclusive use of some of the Kruger’s public roads for evening game drives, well after gate closing time, ensuring an unforgettable sunset experience. The latter two nights will be enjoyed at the exclusive Plains Camp, where two highly qualified guides will share their wealth of bush knowledge with guests on a walking safari. Plains Camp features luxury tented accommodation for a maximum of eight people (no children under 12), ensuring a quality, pristine wilderness experience. For something a little different, guests can opt to walk to the camp’s “Sleepouts”, which are elevated wooden platforms, four metres high, where they can spend the night sleeping outdoors under the stars! Holidaymakers can choose to combine the safari package with a few days in Johannesburg or Cape Town, a tour of the Garden Route or Kwazulu Natal to extend their Gane and Marshall getaway. Prices start from £895 per person, based on two sharing and this applies to travel between 1 and 28 February 2015. 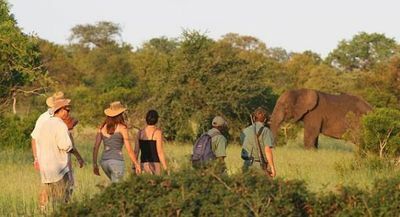 The price includes FREE internal flights between Johannesburg and Skukuza Airport in the Kruger which represents a saving of £195pp, two nights’ accommodation at Rhino Post including all meals and two game drives per day and two nights’ accommodation at Plains Camp, including all meals, one game walk and one game drive per day. Prices for international return flights from the UK to Johannesburg start from £600 per person. To book, go to ganeandmarshall.com.